Lincoln Andrews who is heading up the effort to preserve the Green School has sent out the message: "The Green School has been Saved." Mr. Andrews plans on making a presentation before the Board of Selectmen on August 10 to provide an update on the progress to date. Tax-deductible donations are still needed and are being collected by the Middleborough Rotary Club. To contribute, please mail a check in any amount and made payable to: "Middleboro Rotary". Please notate "Green School Preservation" on the memo line in order to direct your contribution to the preservation of the school. Checks may be mailed directly to Lincoln Andrews, 28 Sachem Street, Middleborough, MA, 02346. For more information, please call 508-947-7071 or email Lincoln at lincolnandrews@hotmail.com. 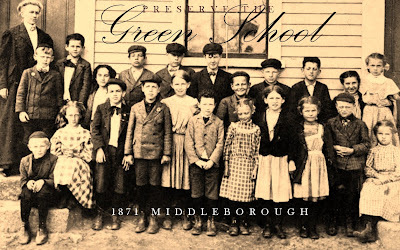 Green School students, photograph, c. 1906.